New build office facilities for the Kennel Club which included special dog facilities and storage for all the Crufts equipment. Staff were encouraged to bring in their dogs and walking areas and lamp posts especially designed within the grounds. They even had dog wallpaper in the meeting rooms. All systems had to meet Breeam Excellent. Mechanical systems included heating and comfort cooling and mechanical ventilation via variable refrigerant volume (VRF) fan coil units with on-floor primary ventilation systems incorporating mechanical ventilation and heat recovery (MVHR) units. 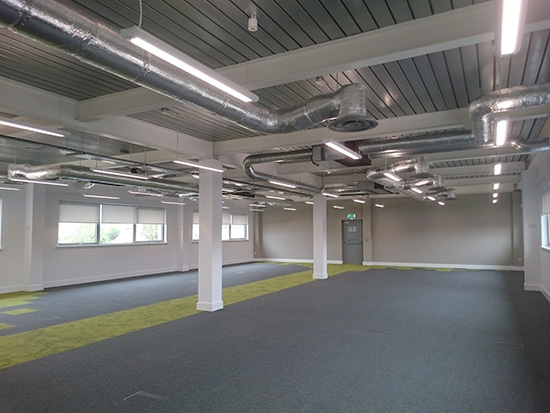 Interview room heating/comfort cooling was designed to a high acoustic specification.